Kawala started their musical journey while studying in Leeds. North London duo Jim (vocals) and Dan (acoustic guitar, vocals) quickly developed a distinctive sound. 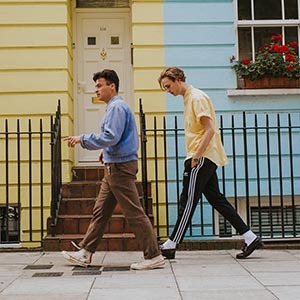 Deriving from their joint love of close vocal harmony, and rhythmic finger-style acoustic guitar, the pair started writing songs inspired by the likes of Bombay Bicycle Club and Half Moon Run. 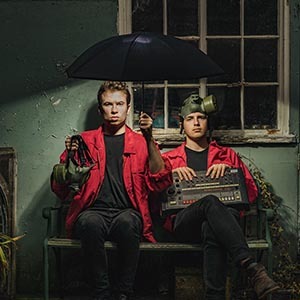 Drawing equal influence from the confessional tones of Bon Iver and Foals as red-blooded 80s pinups like Tears For Fears and ABC, APRE first met in the unlikely musical haven of Ealing Chess Club. They were introduced through the owner Sue, who let the pair use the back room of the club to start self-producing their songs and rehearse their creations live. The first results, ‘The Movement Of Time’ EP, proved an immediate checkmate, twisting those most private moments into widescreen, alternative pop. Its followup – ‘Drum Machines Killed Music’ – began life as one of the boys’ dissertation title, but now acts as a movement of time into the next phase of APRE (discussing the changes in music through the developing use of drum machines). Nodding to the past, present and brightly forecast future, APRE’s quickly-identifiable sound is matched by a keen eye for arresting, slightly surreal visuals (from the early artwork to their instantly-identifiable red jackets). Watch this one. If a whole heap of great music has come from the impulsive, plug-in-and-play school of songwriting, then an equally large portion of Sun Silva stems from very opposite beginnings. Ones based in precision and technical prowess, meticulously brewed into something even bigger and greater than the sum of its many parts. Formed at London’s prestigious Royal Academy of Music, when Oscar Gormley (vocals, guitar), Sam Becker (bass), Charlie Woof-Byrne (keys) and Jake Brown (drums) began noodling around together away from their formal classical training, SUN SILVA most certainly fall in the latter category. All four members are proficient piano and guitar players, while the quartet’s various studies ranged from classical percussion to baroque bassoon. 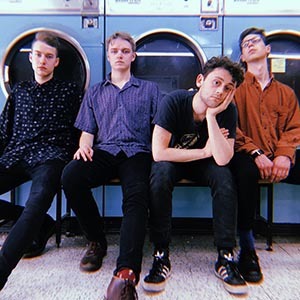 Three-chord wallops, it’s fair to say, are not their thing and even their first sonic moves out of the traps – led by debut single ‘Blue Light’ – are ones filled with the breadth and ambition of a band itching to test the limits of their own possibilities at every turn.